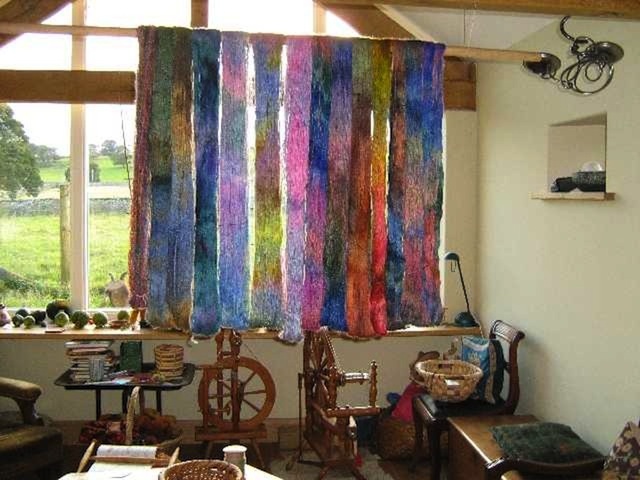 I reconnoitered in my wool-room yesterday; it is full of possibilites for the New Year. Another Aran perhaps, to start off with? Should it blow tradition and be hooded? Six pairs of socks for the Old Man? His “Woodsman’s Sock” shelf is groaning, but the ranks of the lighter socks are thinning. Cushion-covers? What a chance for experiment with color-patterns and Aran curlicues. A shawl with a ten-inch lace border, and perhaps design the border myself? I never did desin a lace-pattern. A huge afghan to keep one’s knees warm while being knitted? A lace-edging for a valance, why not? A revolutionaroy pot-handler? Hey! a Knitted Icebox for camping and picnic? By this time next year some of these will have been achieved, and some scorned and abandoned. Some as yet undreamed-of whims will have taken shape. I’m ready for them; my mind is open, my wool-room full of wool, my needles posed, my brain spinning like a Catherine-wheel. There are plenty of pencils – I think – and where did I see that old block of squared paper? My words, such good fortune. I can only hope the same for you. I think it is so important for fiber users to really be aware of what it takes to produce the wool they love, and to learn that EVERY fleece must be harvested by hand by a skilled crafts person. I love my job so much and love to see people enjoying wool in all its glorious products!